For more major cosmetic concerns, which may include teeth that are too short, misshapen teeth, discoulored teeth , crooked or overlaped teeth, spaces between teeth, ceramic laminate veneers are the perfect solution. It is also referred as “Instant Orthodontics”. 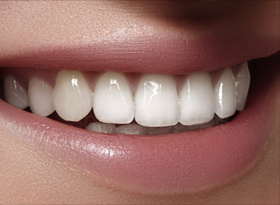 Of all the methods available for changing and improving the look of your smile, porcelain (ceramic) laminate veneers and crowns are the most popular, successful and quick. With the help of these, a damaged tooth can be saved and repaired to look and feel like original. A brighter healthy smile can also create a more youthful appearance. Ceramic laminate veneers are thin shells of ceramic or porcelain, which are applied to the front of the teeth to hide imperfections in structure. At Dr. Gowd’s Dental Hospitals, we have the state of the art technology like the Dental CAD CAM and expertise to create the dental “masterpieces.” These veneers bond chemically to the tooth structure, hence giving them a long lasting effect. 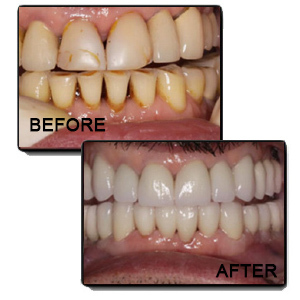 Veneers can be used to hide permanent stains, cracks, chipping of teeth. Sometimes these are also indicated to alter the shape or size of the patient’s teeth, or fill spaces within teeth. 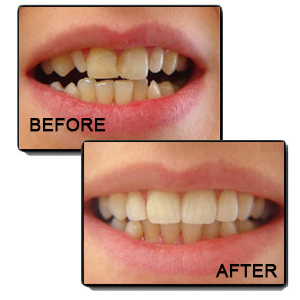 The correction of unattractive front teeth with ceramic veneers involves two clinical visits. The first visit entails the preparation of the tooth, making impression of the prepared tooth and the placement of temporary acrylic veneers. 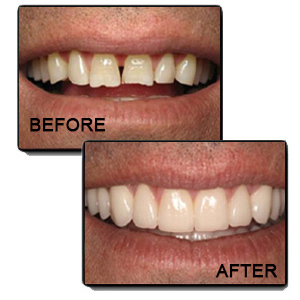 These veneers are then processed in-house in our state-of-the-art laboratory under direct supervision of Dr. M.S. Gowd and Dr. Vikas Gowd. This processing usually requires 2 sittings and can sometimes be done in a single day with the use of CAD- CAM or computer aided designing and computer aided milling or 3D printing technology. 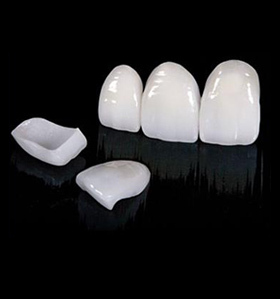 The final ceramic laminate veneers are permanently bonded to the teeth at the second clinical visit. To provide a “white smile” in person with naturally dark teeth. We pride ourselves in providing you exceptional patient care and a range of services in general and specialized dentistry. Our 100+ years of experience, expertise and 2 million satisfied patients only reaffirms our commitment to dental excellence. Our in-house dental laboratory, ISO certification, environmental friendly ambience and affordability, further attribute to our patient safety and comfort.